If you have any questions or need additional information, please contact our Customer Service Department, free of charge at 1-844-347-7800, Monday through Friday from 7:00 a.m. to 7:00 p.m. TTY/TDD users should call 1-844-347-7805, or complete the information requested in the Contact Us section and a Customer Service Representative will contact you. You can also visit our Service Offices, Monday through Friday from 8:00 a.m. to 5:00 p.m. The Customer Services Department offers free language interpreter services and Sign Language. This includes, services in alternate formats such as; Braille, large print, and translation to other languages, verbally or written, amongst others. 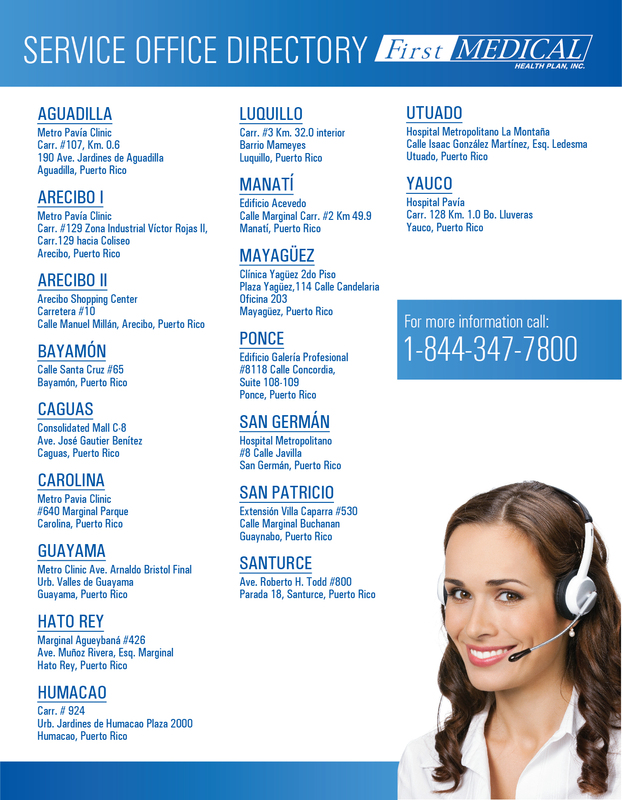 If you need plan information in another format or language, please contact our Customer Service Department. For your information, First Medical Health Plan, Inc., has a Medical Advice Line, which is a telephonic consultation service where you can call and receive orientations and recommendations about your health. This line is a toll-free number and is available twenty-four (24) hours a day, seven (7) days a week. You may contact the Medical Advice Line by calling at 1-844-347-7801. TTY/TDD users should call 1-844-347-7804. You can also call the Medical Advice Line before visiting an emergency room to seek advice on a health condition. By calling the Medical Advice Line before visiting an emergency room you will be provided with a Call Identification Number. With this number, you will be exempt from paying the co-payment for services received during your visit to the emergency room. If you need a copy of the Service Offices Directory, please feel free to contact First Medical Customer Service at 1-844-347-7800; TTY/TDD users should call 1-844-347-7805, Monday through Friday from 7:00 a.m. to 7:00 p.m. First Medical will send you free of charge, the Service Offices Directory in five (5) business days from the date of your request.